Transport Canada is investigating what it calls “a few” complaints of Dodge Ram pickups and Durango utility vehicles rolling while the transmission is in the park position, a condition linked to 25 crashes and nine injuries so far in the United States. The Canadian federal office is documenting and reviewing the complaints as well as working with field teams to obtain more information. The effort coincides with an investigation launched Dec. 20 by the U.S. National Highway Traffic Safety Administration (NHTSA) of about one million 2013-’16 Ram 1500 and 2014-’16 Dodge Durango vehicles after receiving complaints they rolled away after being parked. The NHTSA is urging drivers to set the parking brake before exiting the vehicles. 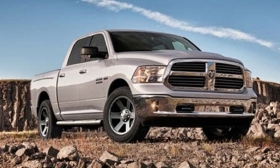 Fiat Chrysler Automobiles said it is cooperating with the NHTSA investigation. FCA Canada spokesman Daniel Labre declined to comment on the number of complaints in Canada and directed all inquires to Transport Canada, which was also not specifying. “As part of Transport Canada’s review process, we will examine the details of the NHTSA investigation and communicate with Fiat Chrysler,” Lalonde said. The vehicles under U.S. investigation have an electronic rotary control knob for driver gear selections that is different to the system recalled earlier this year by FCA for rollaway issues. Transport Canada said that if FCA Canada issues a recall, it will be listed on the agency’s vehicle recalls database. The problem in the recalled Dodge Charger and Chrysler 300 sedans and Jeep Grand Cherokee SUVs has been tied to at least 68 injuries, 266 crashes and 308 reports of property damage, the government said. Transport Canada said it has "an active defect investigation file" relating to that issue. In June, "Star Trek" actor Anton Yelchin was killed in a rollaway crash in a recalled 2015 Jeep Grand Cherokee. Yelchin, 27, died after his SUV rolled backward in the steep driveway of his Los Angeles home and pinned him against a brick wall and a fence. In August, his parents sued FCA for negligence and product liability claims in California.